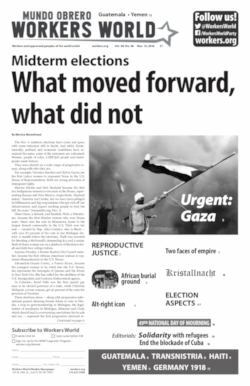 On occasion someone makes such a significant contribution to the cause that the work speaks for itself and, assessed objectively, functions as a weapon in the class struggle. 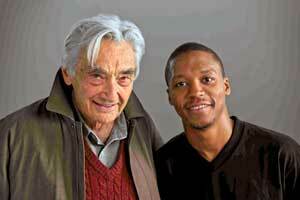 Howard Zinn and recording artist Lupe Fiasco. Such an occasion was the life and such a contribution was the work of Howard Zinn. Zinn, who died on Jan. 27 at age 87, was called “the people’s historian.” Everybody knew who “the people” he strove to serve were: the working class and oppressed nationalities. This is why so many worldwide are mourning his death. Howard Zinn was best known for his groundbreaking study first published in 1980, “A People’s History of the United States: 1492-Present.” From its opening chapter, titled “Columbus, the Indians, and Human Progress,” this book announced itself as something new and different. This was history recounted from an unaccustomed perspective. Unlike virtually every other telling of U.S. history, either academic or popular, and most strikingly unlike the standard textbooks used in schools across the country, “A People’s History” was unabashedly on the side of the masses of people — that is, the workers and oppressed. The conventional version had claimed to be objective. Actually, it skewed the whole sweep of history. In the telling that was fed to generation upon generation of schoolchildren, the invaders, exploiters and oppressors were portrayed as heroes: inventors, explorers, adventurers, saviors. Colonial occupations and imperialist wars were depicted as noble self-sacrificing endeavors by an enlightened, civilizing force. Technological development, scientific innovation, societal advances were all the result of impressive strokes of genius by individual Great White Men. The vast majority of humanity was nowhere to be seen. Not as actors, not as creators, not as drivers of the engine of history. Not even, for the most part, as oppressed by the social and economic forces these standard histories uniformly applauded as natural, positive developments. For example, the trans-Atlantic slave trade was generally treated as cursorily as possible; the central role of slave labor in the creation and enrichment of U.S. capitalism was mentioned not at all. Neither was the other project, the project that along with the system of chattel slavery is the most important fact of early U.S. history: the theft of the lands and genocide of the Indigenous nations of North America. This was the landscape of history. Then came Howard Zinn. What he did, first and foremost, was strip the mantle of impartiality from those other histories. Every telling is biased, he said. My bias is on the side of those who until now have been made invisible. Then he proceeded to bring them onto the page. The Native peoples, fighting to defend their lands and their lives. The Africans shackled and enslaved — and rebelling. The immigrants shivering in tenements, and the workers fighting for unions. The women demanding equal rights. These were the heroes of Howard Zinn’s history. And history has never been the same. Bourgeois historians still constitute the majority of those whose works are published. They are still considered “mainstream” while historians in Zinn’s tradition are dismissed as “radical.” But ever since the first edition of “A People’s History” was published, an alternative has been available. Zinn was not the first or only historian to tell the class truth. There are excellent explicit Marxist analyses that deserve to be widely read. But Zinn’s works, because of their uniquely popular character and the way they passed from hand to hand, played a role like few other books in our time.